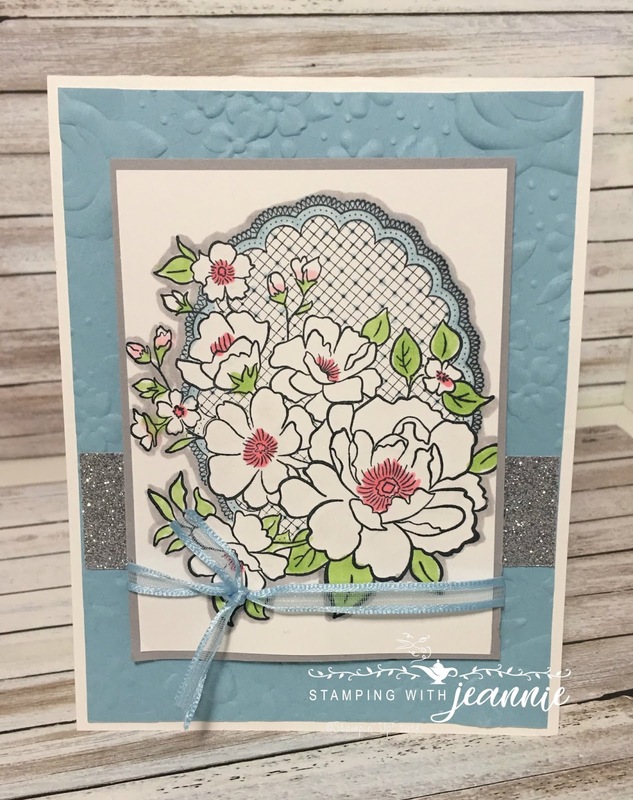 Stamping with Jeannie: Loving the Lovely Lattice! I have to admit that I wasn't a big fan of this stamp set at first. 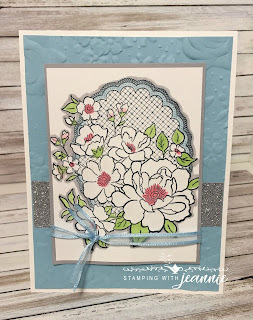 It's a Sale-a-bration stamp set, and I had it right from the beginning, but this is my first card actually using the stamp set! I think I had put off using the stamp set because I felt I had to color in the flowers -- that's a lot of coloring LOL! Well, I actually DID color in all of the flowers -- the whites of the flowers are colored with Wink of Stella, and I'm a huge fan of that look! If you zoom in on the picture, you'll see that I also outlined the entire image with the Smoky Slate light Blend marker -- doesn't it make the image pop?! If I was going to re-make the card, next time I'd probably put my Silver Glimmer strip a bit lower and center the ribbon over the strip. Check out my supplies in the table below! Don't forget to leave a comment for me!